Rob Fletcher speaks to photo products company Albumprinter BV about the HP Indigo 50000 which is now running at their site in The Hague, Netherlands. 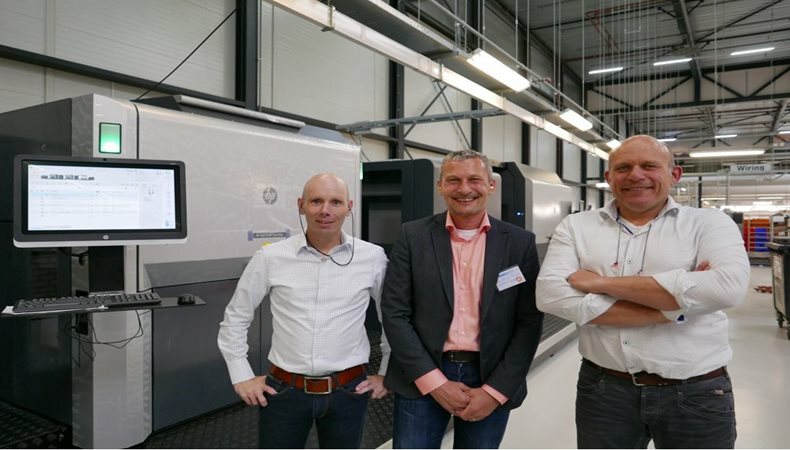 Photo products company Albumprinter BV has become the first print business in Europe to install a HP Indigo 50000 digital press as part of a wider move to boost production across its various brands. Albumprinter is the company behind a number of leading photo printing names such as Bonusprint in the UK as well as Albelli in Belgium, France, Germany and the Netherlands. The firm also operates Fotoknudsen and OnskeFoto in Norway and Sweden and recently acquired Resnap, a startup with a mobile application that uses artificial intelligence technology to select the best quality pictures to create a photo album in a matter of minutes. Due to its expanding business, Albumprinter identified the need to strengthen its production capabilities and turned to HP for support, opting for the oversized B1, roll-to-roll press. HP bills the Indigo 50000 as the “industry’s highest volume digital solution for photo printing”, adding that it will enable Albumprinter to benefit from higher capacity and efficiency for its various photo brands. The duplex colour web press is now in place at the Albumprinter facility in The Hague in the Netherlands. Tristan Money, chief executive of the Albelli business, is full of praise for the new machine and outlines how it will help the company achieve its growth plans. “The HP Indigo 50000 is the next step in the evolution of our Indigo-based photo printing business, growing steadily we invested in our first Indigo in 2007,” Money said. “This latest investment ensures we can leverage and capture our current double digit growth in the business with the extra benefit of lower costs. Key features on the HP Indigo 50000 include an image size of 746 x 1,120mm, allowing users to print photo applications such as size photo book, yearbooks, lay-flat books, long book covers, and calendars. Six-colour printing with light cyan and light magenta photo inks provide further flexibility, while light black inks enable high-end monochrome for professional black and white production. The Indigo 50000 is the latest HP machine to join the Albumprinter portfolio, with the company already running devices such as the HP Indigo 12000, which it installed last year, as well as the HP Indigo W7250 and HP Indigo 6600p digital presses.